And this is why I love Kaki Warner’s novels. Her stories constantly surprise me. She writes complex characters who are deeply flawed but completely lovable. They never start their relationships in typical romance-novel fashion, and there’s not a whiff of cliché in her books. The obstacles they overcome are huge, and quite often they’re obstacles that have developed because of the characters’ bad decisions. Daisy’s no different. She fell in love with Jack when she was singing in a San Francisco saloon, where he was a frequent customer. It was the lowest point in his life, and she thought she could save him. After a brief affair, he left her for Australia and she soon found out she was pregnant. Two years later she’s in desperate need for money. She has no idea how to contact Jack but remembers enough of their conversations that she’s able to locate his family’s ranch in New Mexico Territory. She arrives to discover that asking them for money won’t be as easy as she thought—particularly since Jack and Elena have recently returned home. Chasing the Sun is a gripping novel that had me blinking back tears and then laughing out loud a few pages later. Yet while I was devouring Chasing the Sun, I couldn’t help dreading reaching the end—I’ve spent the past year with the Wilkins family and hated to say goodbye. This novel isn’t just Jack and Daisy’s story; the entire Wilkins clan has problems to overcome as a slimy character from the first novel rears his ugly head again and they all struggle to figure out what it means to be a family and how much they’re willing to sacrifice for each other. Because this is the third and final book in a trilogy, I’d recommend reading it after you’ve read the first two. These are intricately woven stories and situations brew in the first two novels that are only resolved in the third. And I’d highly, highly recommend reading this trilogy. It’s brilliant and is among the best historical romance being published today. If you love high-stakes conflicts, wry humor, and compelling characters, you’ll love Kaki Warner’s novels. 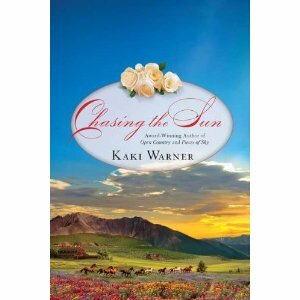 Want to read one of Kaki Warner’s books? Come back next week, when she’ll be answering some questions about her first year as a published author and giving away one of her novels. Thanks for the lovely review. You’re in The Will. Excellent! Since my parents replaced my wedding photo in their living room with a bigger one of my brother and his wife, I was starting to wonder whose hard-won earnings would be cushioning my eventual retirement. Have a baby and you’ll own them forever. Trust me on this. Wonderful interview. And Kat, I must say I can totally empathize with that worry that Kaki’s subsequent books couldn’t possibly measure up to the first –especially when I found out how quickly she wrote book 2 & 3. I’ve only got about 50pgs into Chasing The Sun, and I’m delighted to see that the quality is a strong as ever! If Kaki wasn’t so damn sweet, I’d have to unleash my green-eyed monster and hate her. Instead I think I’ll just try to learn her secret of writing fast and well. Kaki? What’s your secret? And I didn’t know you were a 25-yr-overnight success? That’s one record you may keep all for yourself, my friend. Dang you Texans are stubborn! Looking forward to your new trilogy, but take your time in writing them ’cause I don’t want you to get burned out. I want you around to write me dozens more stories! Thanks, Theresa! Yeah, Kaki could easily inspire jealousy, but as long as she keeps writing we’ll all get along just fine. i found the 2nd book completely by accident (or serendipity) and have loved them. i’m going to have to buy them eventually because i’ll want to read them again. great review. Glad you liked the review, Michelle. I don’t know if you saw that Kaki’s giving away one of her novels to someone who leaves a comment on an interview I did with her this week. Pop on over there and leave a comment so you can add one of her books to your keeper shelf.